1 snap closed, for secure storage, 4 pockets total. for comfortable riding in hot or cold weather. The FIM840 is everything a rider wants in a motorcycle chap! I can only say good things about Dominic and his Staff. I was looking for brown chaps only. He found me a pair. Well I ordered the wrong size and the color did not match my bike as I thought. He exchanged them for the same chaps but in black and my correct size. The process was great. I even talked with Dominic on the phone and he was very professional. Thanks for great service and quality merchandise. 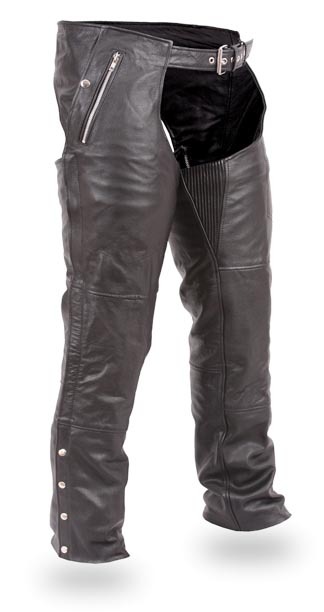 I will be ordering my wife's chaps shortly. The chaps are great fit and I took them to a local seamstress to get the hem done. Great color and feel. Click the button below to add the FIM840CSL The Patriot Unisex Double Deep Pocket Thermal Motorcycle Chap to your wish list.